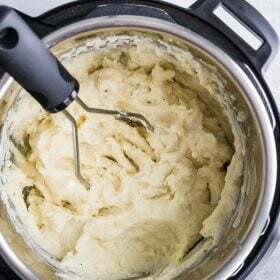 These are the most delicious and EASY mashed potatoes that can be made right inside of your instant pot or pressure cooker. Place the trivet into your instant pot (the one that came with it) and pour in the water. Place the peeled potatoes on top of the trivet. It’s okay to stack them if needed. Put the top on and seal the instant pot. Cook on manual HIGH pressure for 15 minutes (if your potatoes are sightly smaller, go for 13 minutes and if your potatoes are extra large, go for 17 minutes). ** When the instant pot is done cooking, let the pressure naturally release which will take about 8-10 minutes. You’ll know it’s done when the metal pin has dropped. Carefully take out the trivet and drain out the water. Mash the potatoes until little to no chunks remain. Stir in the butter (the residual heat from the potatoes will melt the butter), milk, salt, pepper, garlic powder, and mayo. Mix until combined and creamy and enjoy immediately!